Now firmly established as one of the UK's leading and most authentic ABBA Tribute Bands! 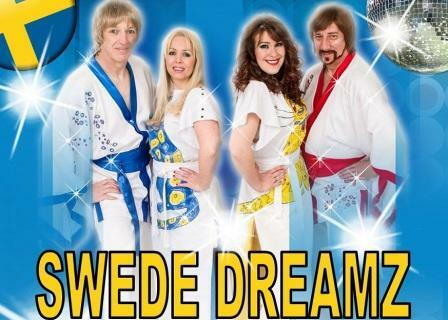 Swede Dreamz bring you superb live vocals and harmonies throughout the show, stunning replica stage costumes (upto six costume changes per show) and a fantastic light show (with optional stage haze). A Swede Dreamz Abba Tribute Show really does capture all the magic and excitement of one of the world's most successful and entertaining live bands. With audience participation throughout, you're sure to be 'having the time of your life'! Swede Dreamz are available for hire throughout the UK. The show is ideal for Corporate events, Hotels, Cabaret, Party nights, Holiday parks, Private parties, Weddings and Anniversary celebrations, Social events etc. Swede Dreamz bring all you need to make any sized venue come alive! PA System upto 5kw, Front stage FX Lighting plus rear Stage lighting rig with stage cans, moving heads and backdrop (subject to space). Stage haze is optional extra and can be used to enhance the Light Show if required.